One day, Gracey turned up at the shop. Lost. Befuddled. Out of place. Tuesday means we are back with more translations! 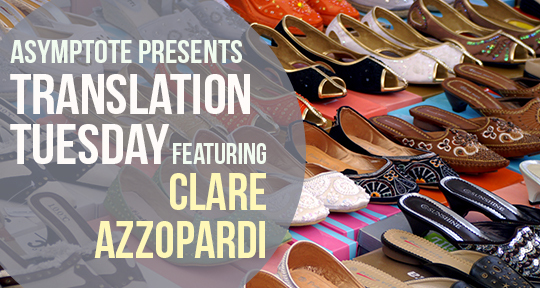 This week is a first for us as we travel to Malta with Clare Azzopardi’s story “Gracey”, translated from the Maltese by Albert Gatt. A sense of glumness and class disparity permeate this beautiful story. Helen always looks glum. She finds it so much easier to look glum. She won’t give anyone that satisfaction. She looks glumly upon the vegetables sold by Fredu who’s parked, on Tuesdays and Thursdays, at the next corner down from where she lives; she looks glumly at the fresh ġbejniet on the counter in Vitorin’s hovel of a shop, before she asks her to wrap four up for her; she looks glumly at the girls wearing pink shoes and the boys whizzing past on bicycles; she looks glumly at the women who put a chair out on their doorstep on summer evenings and while away the time chattering or reciting the rosary; she looks glumly into every shop window in Republic Street and every shop window beneath the arcades; she looks glumly from where she’s sat, surrounded by shoes, at the people walking past in a hurry; she looks glumly at Polly, who’s always scrounging for empty lemonade bottles; she looks glum as she dusts the shoes in the shop, as she counts the cash, as she raises the shutter, as she lowers the shutter; she looks glumly at her own face in the ancient, brown-stained mirror hanging on the wall in the dark, narrow corridor and at her own image in the long mirror inside the wardrobe door. She looks glumly at her mother, aged and doddering, as she sits in an armchair in the balcony with the shutters closed listening to the radio against her ear.